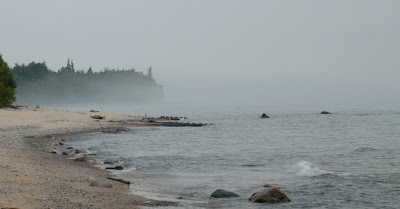 Walking the forest path from Hurricane River to Au Sable Point on a foggy day, then hiking back via the rocky Lake Superior shoreline offers a spooky experience and a good way to work off the effects of a whitefish sandwich and pale ale from Lake Superior Brewing Company in Grand Marais. This stretch of Pictured Rocks National Lakeshore is different from the dramatic cliff-dominated shoreline to the west, but is very dynamic and interesting. Boulders and slabs of colored sandstone are glimpsed through the trees along the flat, 1 ½ - mile path that begins at the mouth of Hurricane River and ends directly behind Au Sable Point Lighthouse. Once at the Lighthouse, scrambling down the hillside to the beach offers a view to the east of the curving, 5-mile expanse of Grand Sable Dunes looming in the foggy distance. Heading west back toward the river mouth, the shore starts out sandy but then gives way to smooth beach stones followed by large multicolored rocks and boulders. A rock ledge separates the beach from the woods above and draining water trickles over the shelf and out from its face. 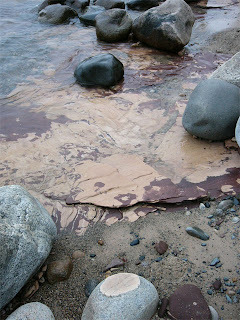 Beneath the rocks strewn along the beach are multiple layers of sandstone slabs in various red, yellow, and brown hues. Centuries of ice and crashing waves have created unusual textures in these slabs. Holes have been worn through in places creating pockets holding smaller stones. 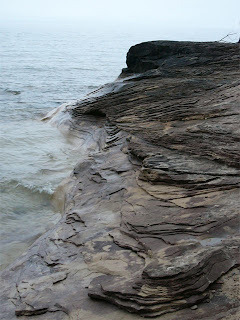 The layered rock is decorated with swirls of red and yellow, and strange round nubs stick up here and there along the otherwise smooth surface. 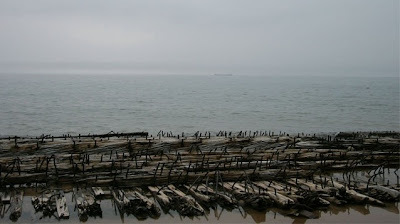 The remains of the shipwrecked Mary Jarecki, a freighter that strayed off course in the fog and ran aground in 1883, are located along this stretch of Lake Superior. My imagination, over-stimulated from reading of horrifying tragedies along this stretch of frigid lakeshore while doing research for an essay on Great Lakes shipwrecks, pictured these remains very clearly (and irrationally). In my mind a decayed but recognizable hull rose out of the sand at a perilous angle, complete with intact weather-beaten crow’s nest (do freighters have these?) bearing the ragged skeletal structure of an ill-fated mariner. Is that too much to hope for after 125 years? Surprisingly, it turns out that no one died in this particular shipwreck and what is actually visible today are oak beams with iron pegs partially buried in the sand and underwater. At the sound of the foghorn I looked up over the misty lake and spotted another ship slowly creeping along in the murky distance. The sudden eeriness of the moment made up for any disgruntlement I had been feeling over the lack of washed-up treasure or hastily-scrawled last words carved into driftwood. If the weather had been clear and sunny, the experience would not have been nearly as perfect. Beautiful pics. Thanks for helping me forget where I am for a half-minute. Even in terrible weather, this place is still beautiful. Great job capturing the mood! Very well written. I certainly need to add this to my list of places I would like to visit. I've always confined my hiking to the west end of the park, but I would love to see that shipwreck. Thank you! This was the first time I visited the eastern end of the park myself. I also tend to spend my time in the western half and felt it was finally time to branch out a bit.